At around 12:30, shortly after the weather had cleared up, I saw Ice Cube's tour bus park in front of the Hilton Hotel across the street from the theater. I walked over there hoping to see if he was on there. The driver came off first and I asked him if Cube was on board, he just smiled and said, "naw." I didn't really believe him, so I hung around in that general area just in case. About 15 minutes later Cube emerged from the bus and headed toward the hotel. I caught up with him and asked him to sign my CD. He was really cool. I even got to tell him how much I enjoyed his appearances on my favorite radio show, The Ron & Fez Show, which he immediately recognized and said he enjoyed doing. Unfortunately, my picture opportunity with Cube didn't turn out so well. The guy he asked to take our pic really couldn't figure out how to use my phone. It took multiple times. At one point Cube grabbed my phone and showed him how to do it. This picture is the result. I'm not complaining, this was one of my all-time favorite celebrity meetings, so the "bad" picture just adds another memory to this memorable day. 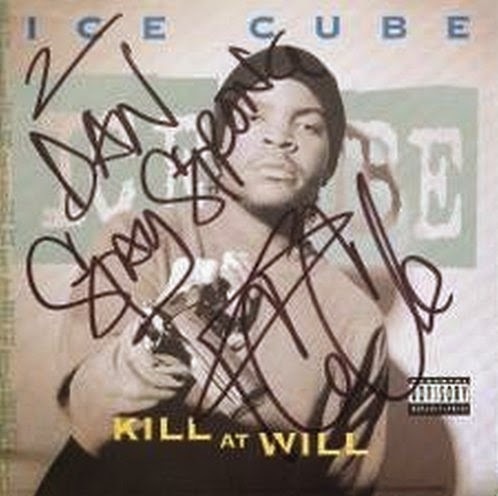 Ice Cube signed the front cover of the Kill at Will CD.